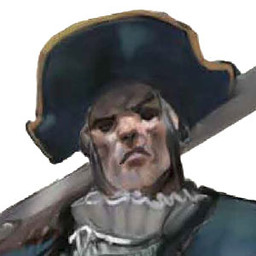 Arronax Endymion was once an admiral in the navy of Cheliax, but nowadays he is a member of the Pirate Council of the Shackles. He is captain of the frigate Tyrannous, and leads a squadron of Shackles Pirates known as the Devils’ Own. He rules the port of Hell Harbor on the island known as Devil’s Arches. He is a lover of traditional Chelish opera, performed in the original Azlanti (not to be confused with the modern style currently popular in Cheliax). It is not known what scandal forced the former admiral to resign from the Chelish navy. Thus far, he has slain at least six people who had claimed to have known specific details of his disgrace. The admiral has barred ethnic Chelaxians from his town, allegedly because he worries that his new career will not have found favor in Cheliax. He is also seeking to exterminate the town’s large imp population, in case some of them are Chelish spies.